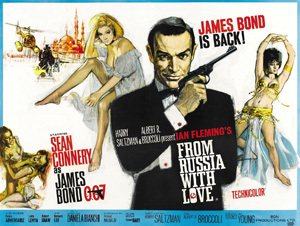 Directed by Terence Young and filmed on location in Istanbul and at Pinewood Studios, ‘From Russia With Love‘, the second entry in the James Bond Series, introduces many of the staples of the franchise – from the scantily clad dancers of the opening credits (belly dancers referencing the Gypsy camp sequence), a Bond Theme sung by a popular artist of the time (Matt Monro) to the institutions that are ‘M’, ’Q’ branch and Moneypenny. And of course a certain SPECTRE ‘Number One’ complete with his accessory of a choice, the wide-eyed white furred cat. The filmmakers rather playfully reference Ernst Blofeld in the end credits as played by ‘?’. The opening sequence is unusual in that it doesn’t open with Bond at the conclusion of his latest mission, rather we’re introduced to a brutal opponent, Red Grant (played with unsettling menace by Robert Shaw) getting the drop on what appears to be agent 007 himself – except this is SPECTRE Island, and they sometimes train with live targets. Grant, an escaped murderer from Dartmoor Prison, is picked up and trained by SPECTRE. We know from the off that this villain is at least the physical match of Bond and throughout the course of the film he stalks his every move leaving a trail of dead bodies and in one instance actually saving him from a knife attack. When we finally get the confrontation between Shaw’s Grant and Connery’s Bond it doesn’t disappoint. Shaw plays the part superbly well, passing himself off as an upper-class British liaison officer only to arouse Bond’s suspicion by making the gastronomic faux pas of ordering red wine with fish. Bond ultimately proves to be the more elegant, refined killer. The plot is a more conventional, sober affair than the usual Bond story lines, with Cold War espionage at the heart of it. Blofeld draws a parallel via his Siamese fighting fish between the main protagonists in the story – the British and Soviets fighting themselves to a standstill until finally SPECTRE picks off the exhausted victor. The prize at stake is a Russian ‘Lektor’ decoding machine that both the CIA and the British Secret Service have been desperate to get their hands on for years. The plan conceived by a famous chess playing SPECTRE agent centres around a honey trap whereby beautiful Russian cipher clerk Tatiana Romanova, played by Daniela Bianchi, is tasked with ensnaring James Bond with a promise to steal the Lektor device for him only for SPECTRE to swoop in and seize it for themselves. Rosa Klebb, SPECTRE’s number three, a defector from SMERSH (covered up by the Soviet hierarchy to save face), leads the mission, recruiting Romanova and Grant. Klebb is one of the more cold and ruthless enemies that Bond encounters, with a penchant for knuckle dusters and shoes with poison tipped blades and an apparent fondness for young women. Composer John Barry, Lionel Bart, Matt Monro and Monty Norman all contribute to the soundtrack – the opening credits actually opt for a jaunty musical version of the title track and it’s not until the end credits that we get Matt Monro’s rendition of ‘From Russia With Love‘ (although there is a snippet heard on Bond’s radio during a romantic encounter with an old flame in England). Monty Norman’s famous James Bond Theme gets an outing in a slightly unconventional manner as we see Bond sweeping his apartment for listening devices accompanied by the trademark guitar riff. Bond very rarely succeeds without a little help from his friends, and on this mission he’s ably assisted by the hugely charismatic Kerim Bey (played by Pedro Armendariz), a man who could possibly give Bond a run for his money when it comes to notches on the bed posts. Q Branch’s appearance is short and sweet and devoid of the trademark back and forth but does provide some useful yet believably real spy gadgets which come into play at various points during the film. ‘M’ is typically tetchy with Bond and the long suffering Moneypenny indulges the flirting in her usual fashion. The set pieces that punctuate the story in ‘From Russia With Love‘ whilst lower key than those in future Bond films are very much in keeping with this iteration of Bond – the Gypsy girl fight that turns into something approaching a wild west shootout, the helicopter attack (inspired by Cary Grants’ iconic crop duster scene from ‘North By Northwest‘) and the boat chase with the improvised use of barrels of fuel and a flare gun. These are in keeping with the overall, lean, efficient feel of the film. If anything ‘From Russia With Love‘ shares DNA with the recent Daniel Craig films, in that it’s less about spectacle and more about the spy game and striving for authenticity, certainly more so than many of the films that followed with ever more fantastical set ups. Sean Connery at this point in his Bond career seems extremely comfortable in the role, if somewhat cold and serious. Very few Bondian puns are in evidence but when they come along they’re worth the wait (“She’s had her kicks”). This Bond feels more like the Bond of the Ian Fleming novels, the gentleman spy capable of ruthless violence with a standoffish approach to the women that fall for him. Considered by many to be one of the best Bond films, ‘From Russia With Love‘ represents a high point in the James Bond series, a classic slice of Cold War era drama that further cements 007 as one of the iconic film characters in movie history and leaves the viewer ready to experience further classic missions.